Is a Book Con Worth It? I recently attended my very first convention, the Romantic Times Convention in Reno, Nevada. As an introduction to a SUPER new scene, this was nice and gentle. I’ll do my best to give you the pros and cons and lead up to my answer to the question: was it worth it? Discount option available with the FANtastic day pass. The RT convention includes this wonderful option for a one day fan pass that was steeply discounted at 55$ (USD). I’m not sure if other conventions have something like this, but if they do I really want to take advantage of it in future. 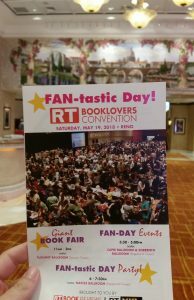 The fan pass included the giant bookfair (swag!) and two big events (free books!) as well as a few of the workshops (learning!). Obviously this is a pretty freaking good deal and a definite pro. Where do I go? What time do I show up? Where is everyone?? Not to worry, RT had me covered with multiple emails before the event covering everything I might need. At the con there were nice signs and volunteers to point me in the right direction and, to summarize, I never got lost or felt like I didn’t know where to be. Yes, the fictional boyfriends NerdyPost shirt got LOTS of comments. The fact that the con was less than thirty miles from where I live was a huge reason the RT con was my first convention. How could I pass it up when the next closest conventions are in San Francisco, Los Angeles, or Salt Lake City, and a full day of driving away? It could be the high of being kid-free for several uninterrupted hours talking, but I had a lot of fun. 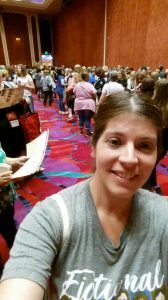 There were a lot of other bookworms wandering around the Peppermill casino, sporting bookish tote bags and name badges and talking about books and, overall, it was awesome to be one of them. The main point of a book con is the books, non? Well, mission accomplished. There were tons of authors at the giant bookfair. Book displays as far as the eye could see. There were a few big name authors, and I got a book signed by Lorraine Heath (she was so nice) but most of the authors were completely new to me. I have so much Internet searching to do now. Wending my way between all of the booths I got a good feeling for what worked to entice me over as a reader, and what didn’t. For some reason, the authors who were standing rather than sitting seemed more approachable. Colorful displays worked, natch. Looking happy to be there was a good strategy. Books in the genres I like caught my interest. Definitely the eye-catching covers. A clear, easy-to-read way to find the author and her books right smack on the author swag was also important! Plenty of swag had the book cover and a quote, and that was about it, which was sad. These are all good things to remember for when it’s my turn. Every con is different, of course, but a one day pass as a fan for this convention was around 150$. The entire convention ticketed at 460$ for readers, 420$ for their spouses who wanted to attend (!!). As an author, it would have cost me 515$ to go. I mean. Ouch. I know this wasn’t, say, San Diego Comicon levels of $ouch$ but still. Who has that kind of money to throw around, and then still be able to afford a hotel and travel and food? It gives a whole new meaning to the term “starving artist”. Peopleing is not my main skill. As an introvert, this was a challenge. Crowds make me very nervous, and I can’t introduce myself to strangers very well. I mentally prepared like crazy and I made it through, but I think I’ll have to work up slowly to attending anything like this for more than one day. Cons are definitely made for more extroverted fans. If you enjoy the noise and energy this won’t be a downside for you, but it was for me. Yes, the convention was close this year. Next year there won’t be a Romantic Times convention, but it will continue on as the Booklovers Convention and guess where it will be? New Orleans, Louisiana. Travel is definitely going to be an issue next time. Remember how there were so many new-to-me authors? 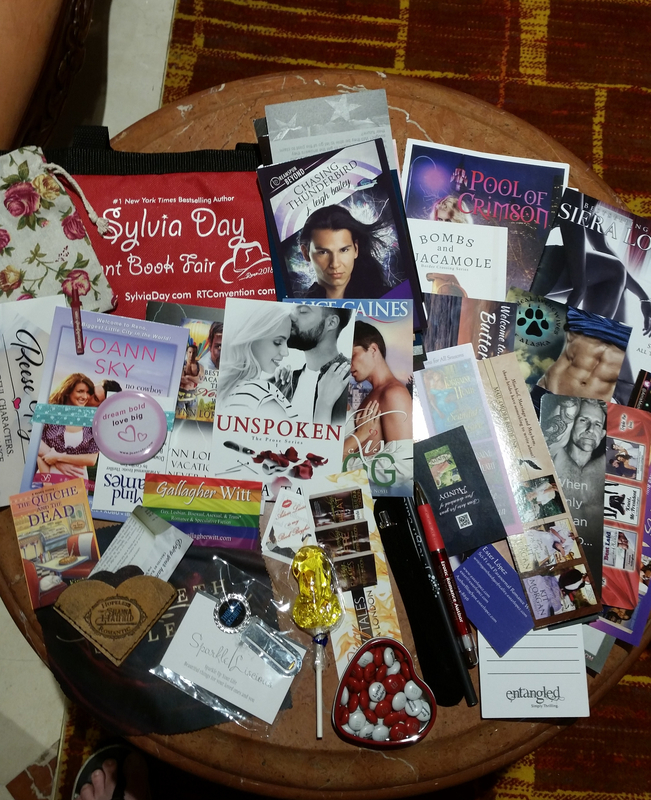 Well, I got literally an entire bag full of swag from all of those new authors. It was cool swag, and I’m glad to have it. 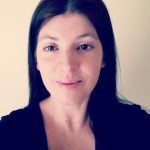 At the same time, it gave me a feeling like I was missing out on so much (fear of missing out-FOMO) and I needed to get online immediately and catch up, right now. These authors are hoping and counting on selling a book to me, but in the end I might not buy. I’m going to take my time, evaluate which books I’d really like to have and which are probably not my thing. This is kind of a weak argument against cons, I did get lots of neat free bookmarks and pens and things, but I felt like I should include it. Considering everything together, attending a book convention is worth it, at least once. If you can find one within a reasonable distance, the price isn’t too steep for you (or there are discounted options), and there will be authors you really want to support there, I say go for it. I plan to get to at least one convention in 2019. Here’s a handy list of romance conventions and conferences (for 2018/2019) from RomanceRefined.com, and Publisher’s Weekly has a more general list of book cons, festivals and fairs in 2018 here. Go get your con on, bookworm friends.